Hot Springs, Arkansas and our spring break route. In a little over a month, we’re using Nick’s spring break from teaching to fill in a blank region on our road trip map. Like many of our voyages, the initial direction was determined by a national park, so we’re heading southwest by car to Hot Springs National Park in Hot Springs, Arkansas. The smallest of all national parks is dedicated to the natural hot water that flows out of the Ouachita Mountains. It was actually the first area in the country to be federally protected in 1832, but didn’t become a National Park until 1921. A row of elaborate bathhouses was developed beginning in the 1870s to serve the growing numbers of people who traveled there to take advantage of the relaxing and supposed healing qualities of the thermal waters. Fun science fact: the 143 degree water that flows from the mountain started its journey 4,400 years ago when it fell as rain on the surrounding hilltops. This National Park is somewhat unique in that it maintains a system of use and preservation, rather than keeping things in a completely natural state; hot mineral water is collected and distributed for use in the community. 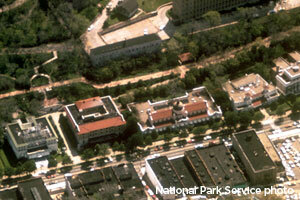 The main attraction is the historic spa buildings known as Bathhouse Row. Guests can still receive treatments using the spring water at historic Buckstaff Baths and the more modern Quapaw Baths and Spa. Buckstaff seems like be the more authentic experience, although the accommodations look a bit institutional by current standards. And when I say institutional, I really mean “asylum.” But how often do you have the opportunity to be placed in a metal steam cabinet with only your head sticking out? Other activities in the park include hiking trails, scenic drives and the Grand Promenade, more than enough to entertain us for a day. After Hot Springs, the trip goes family-style with a visit to my brother and fam in Fort Worth, Texas. In the DFW area, we’ll set our sights on visiting the 6th floor museum in Dallas and the various other cultural amenities around the Metroplex. Fort Worth has a great collection of museums in the Cultural District west of downtown. It’s also the home of the world’s largest “honky tonk,” whatever that is. If you’re reading this, you must know we love to eat, so we’ll be on the lookout for some dining hot spots as well. We’ve already heard plenty of “you’re going to Texas and not going to Austin?” But alas, there is not enough time to do it justice, so we’ll save it for another trip (we still have to make it to Big Bend National Park after all). A European parental visit means we’ll have to return to Chicago by Friday, the 29th. To make the trip a loop, we’ll head north out of the Fort Worth on I-35, checking off Oklahoma and Kansas on Nick’s yet-to-visit states list. The strangely-rolling Flint Hills region between Wichita and Emporia, Kansas and the scenic byway that crosses it will provide a geographic diversion along the way. Our overnight stops on the return leg are still to be determined, but most likely will be Oklahoma City and Kansas City. A stop in Kansas City could be a nice way to experience more sites related to the Harvey Corporation as their headquarters was located in Union Station there in its heyday. 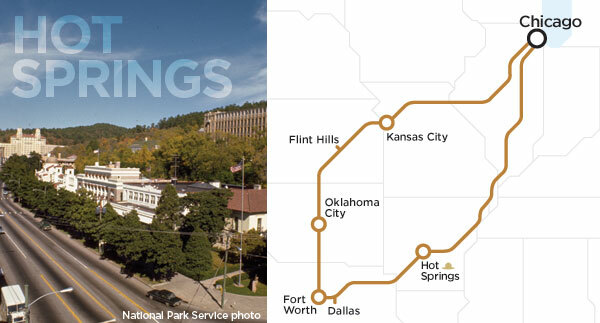 This entry was posted in Destinations, Upcoming Travel and tagged Flint Hills Scenic Byway, Hot Springs Bathhouse Row, Hot Springs National Park, Kansas City Road Trip, Oklahoma City Road Trip, Road Trip Chicago to Fort Worth. Bookmark the permalink. Thanks for the tip! The Wichita Mountains look amazing, we might have to consider a detour. Also, I noticed there are some crazy similarities in our National Park visits … We were in Redwoods when the whale was in the river too.